I always thought my garden was safe for little ones. After all, I have little nieces and nephews that frolic in the backyard; I also have dogs and cats that meander about. But when I became pregnant, I began researching the plants with low-hanging leaves that looked interesting from a two-foot eye level. There was a main theme to my findings: these leaves are not edible, do not eat any part of this plant, and the seeds are toxic to humans and animals. Panic set in! This kid was never going to leave my side. He may never be allowed outside—period! And then I took a deep breath. I started thinking how I could educate him about what to touch and eat while having some fun in the garden. Out of my fear grew a kid friendly garden. My first step was to fence in an area for a vegetable garden. 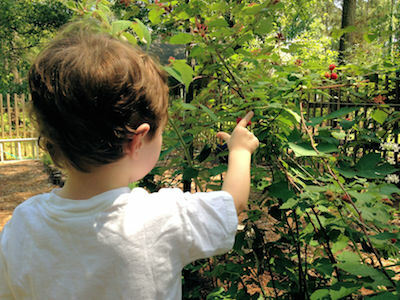 He quickly learned to love this area and as we walked past he said, “Yum!” This area became the safe zone for my son where he could harmlessly be around plants and learn what was edible. The odds were very good that if he found a bright-colored object, he could pop it into his mouth without danger. My husband and I selected cherry tomatoes, bush beans, and snap peas. These items can be easily picked at his level, they taste good raw and they are a good bite size for little ones. Next, we added strawberries so there was something ready early in the gardening season. As he got older, we added raspberries—a bit of a challenge, as there was a little negotiating to be done between the thorns. He quickly mastered that skill in order to retrieve the sweet reward. We also found that he wanted to smell everything he touched and certainly before eating it, thus an herb garden began. 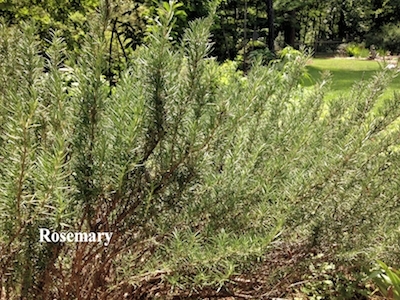 My son never misses the chance to run his hands through the rosemary bush, cup his hands to his face and with a big smile say “delicious.” Oregano also became a favorite of his. It is rugged enough to take some vigorous tugging without being pulled out. Other herbs that didn’t taste good to him, but were a good learning experience, were basil, parsley, and chives. He loved picking the pink flower heads of the chives but one taste was enough. The addition of fruit trees planted throughout the yard expanded his awareness of what was edible. These plants are a much different structure, much larger and some give you the opportunity to climb. We grow figs, pears, peaches, and pineapple guava in the ground and lemon and lime trees in large containers. He has quickly learned to look for flowers on these plants, and he knows those flowers will turn into fruit. So if you pick a flower, you are also picking a future fruit. These trees stand up to the brutal picking skills of a little one, but to him it seems like an eternity from when you see the flowers until you can eat the fruit. My son is now three. He has learned a lot about approaching plants and asking before pulling or tasting. As an added bonus for parents, a garden is a great tool for teaching color identification. My son has also developed a love of gardening as he grabs his little gloves, shovel and watering can any time he sees me reach for mine. I am grateful he has embraced gardening, but I am more grateful (and have much less anxiety) knowing that he has a basic education about what is edible and that he applies common sense in new environments. It is invaluable knowledge for a little person to develop and that knowledge will grow with him the rest of his life. About Corinne Queenan: Corinne is a Lexington County South Carolina Master Gardener. She has her own marketing communications company (Queenaco) specializing in marketing materials, branding and graphic design. Originally from the Chicago suburbs, Corinne has lived in South Carolina for seven years. She is married and the mother of one, “unless you count the furry kids--one dog and one cat,” Corinne says.